Guruji Shri Narendra Babu Sharma have given lot of details on keeping tortoise at home like how to keep, in which direction to keep, what to do after keeping etc. All these questions are answered below. We should not keep alive tortoise at home. 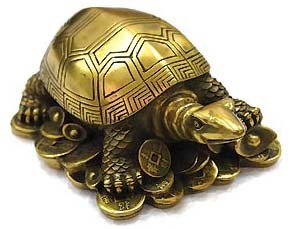 The idol of tortoise should be of Panchaloha - literally, "five metals" which are alloy of gold, silver, brass, and iron with copper as the major constituent. The idol of tortoise should be of Panchaloha, if not it can be made up of any five metal as mentioned above. The idol of tortoise should not be of Sand or Stone. After getting the idol of tortoise, take a container and keep the tortoise in it. Fill the water in the container, till the 3/4th i.e 75% of tortoise idol gets submerged. The tortoise should be facing in North (Uttara in kannada) direction, the back of tortoise should be facing South. Dont keep it cross positions. You should change the water in the container everyday. If not possibe the water should not exist more than 5 days. Cleaning of water everyday is very good. Put Usheera or Lavancha root in water in small quantity. You will get this Lavancha root in gandhige angadi where pooja items are sold. Keep four leaves (in single stem) of Tulsi on the top of tortoise in the morning everyday. Keep Three leaves (in single stem) of bilva patre (Aegle Marmelos) on the top of tortoise in the evening everyday. Everyone in the family should have darshan of tortoise before leaving home everyday. Feel the difference within a week. I bought tortoise with great exitement.. and also i gifted 2 tortoises to my friends also.. but from the day the tortoise was bought to our home we are placing several problems at home.. i fell ill.. and then my father is facing health problems now.. so i gave the tortoise to my neighbour because she wanted tht to keep in her house..
Did you follow the instructions that is told by Guruji. What metal is the tortoise made of? It's recommended that its made of Panchaloha. how often do you update the site... could you please update the latest informations as well. You were doing a yoeman's service for working people like me to keep abreast of Guruji's discourses. Hi, I have already updated Sri Ahobilam Maha Kshetram - The Abode of the Nine Narasimhas which guruji is going to talk this whole week. I have 2 tortoise which r gifted . I am not facing any problem by them but i just want to know how to do pujA OF THEM. I would like to buy the tortoise because I am not getting the tortoise made up of Panchaloha. Every where in the market it is made up of only silver, copper, or any single metal. from where do I get the same online. please tell me the instructions to keep tortoise at clinic..
All useless things said here. People can live happily even without turtle! Believe in this practices and you'll lose your peace, patience, etc. Even a poor will be rich if he decides he is happy with what he has.